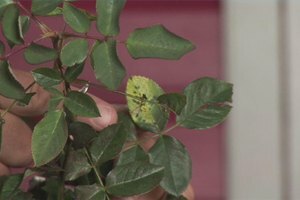 Double knockout roses are pruned by trimming them to maintain the double bloom and the tight bush look. 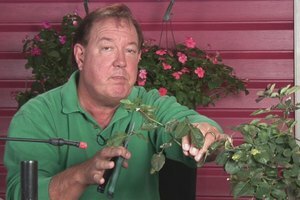 Find out how trimming a double knockout rosebush may cause new flowers to form with help from an urban horticulturist and gardening adviser in this free video on growing roses. Hi I'm Stan DeFreitas, Mr Green Thumb. 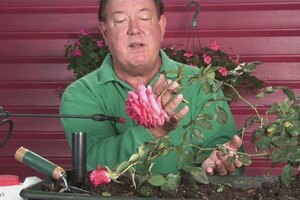 Alright so you've got the double knockout roses and you want to know how to trim them. Just like you trim everything else, you're going to have to keep it within a certain size and shape. 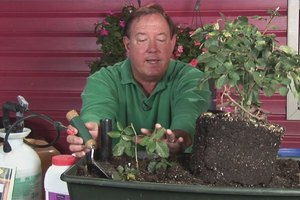 Remember there's a shape and a size and a form for just about every plant. The double knockouts have the double bloom and they've got the tight bush look. Now the problem with that is they tend to sprout out sometimes two or three feet out from the mother plant. When that occurs you need to go back in and do some trimming and kind of keep it at bay. 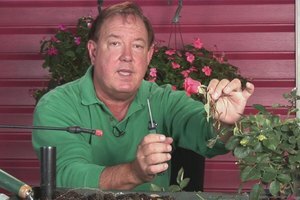 So if you trim out that stem that's coming out too far and you trim it off near the mother plant, it'll sprout out a new sprout which means you'll get more flowers. 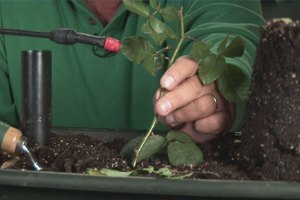 Every time you cut a plant it should sprout out at least two more stems. So in a sense we're making this double knockout even bushier which means you'll get twice as many flowers by trimming it back. Now do remember like all roses you get your flowers on the terminal growth. 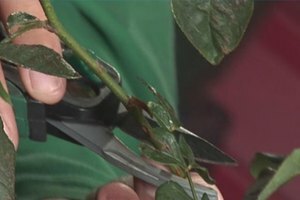 So if you trim it back totally you'll probably go three or four weeks before you get any new flowers. But that's a price to pay to have a good looking double knockout plant. For askmrgreenthumb.com, I'm Stan DeFreitas.